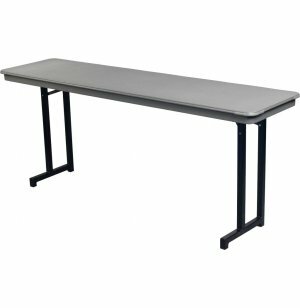 This is the perfect seminar table for any company that uses training rooms for many different purposes. Cantilever legs offer excellent support while maximizing legroom. These Lightweight Plastic Folding Tables are perfect for just about anything. With a selection of shapes and sizes, you can enjoy their strength and versatility in the social hall, training room and anywhere else where you need tables. High-impact ABS plastic tops feature a heavy-duty honeycomb core, offering surprising strength, while still being incredibly lightweight. 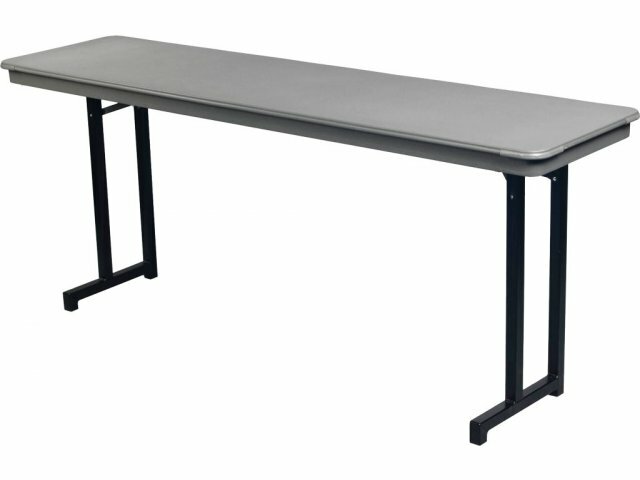 Solid built-in corner edge construction further protects your folding tables from rough daily use. Folding tables get a lot of wear and tear, so it is important for their legs and folding mechanisms to be very tough. With 14-gauge steel legs and an all-welded, heavy-duty steel internal frame, you get great support. A patented spring-loaded locking system locks legs securely in the open or closed position for dependable stability. When it comes to choosing the right folding tables, sturdy, lightweight tables are always a great choice. Durable Tabletop: Pure, ¾"-thick ABS plastic top offers high heat and impact resistance. Lightweight: Rigid, heavy-duty honeycomb core keeps tables strong and surprisingly light. Stable Positioning: Glide-matic patented spring-loaded locking system locks legs securely in the open or closed position. Sturdy Support: All-welded, unitized, heavy-duty steel internal frame and 14-gauge steel legs keep tables standing strong. Floor Protection: Stands on high-impact, load-bearing, non-marking plastic glides.